The Sorigué Foundation furthers the business group’s desire to give back to society through different activities with a clear social, educational and cultural commitment. PLANTA is a meeting point between the Sorigué company and its Foundation. It is a project that encompasses Sorigue’s commitment to giving back to society, to its values and to the future. Since 1992, the Sorigué Foundation manages an occupational centre for the mentally disabled, providing assistance to more than fifty young people. The building was opened in 1991 by the president of the Government of Catalonia. The foundation also takes part in different welfare activities collaborating with various social projects promoted by public and private institutions. Over the last 15 years the Sorigué Foundation has created one of the most important contemporary art collections in Spain, receiving the Arts and Patronage Award, by “la Caixa” Foundation, in May. Among the internationally acclaimed artists featured in the collection, names such as Anselm Kiefer, William Kentridge, Bill Viola, Chuck Close, Anish Kapoor, Antonio López, Daniel Richter, Antony Gormley, and Julie Mehretu resonate. The Sorigué Foundation stays very active in its policy of lending to national and international institutions. It has lent works to renowned institutions such as the Thyssen-Bornemisza Museum in Madrid, the Museum of Modern Art (MoMA) in New York, the Fine Arts Museum in Bilbao, the Albertina Museum in Vienna, the Santa Monica Museum of Art in California, Tate Liverpool, the Andalusian Centre for Contemporary Art (CAAC) in Seville, Arts Santa Mònica in Barcelona, Palazzo Fortuny in Venice, and the Museum of Fine Arts in Boston, among others. Currently the collection is developing new proposals by specific prominent artists such as Bill Viola, Wim Wenders and Chiharu Shiota, for the PLANTA Project. PLANTA project brings together Sorigué’s business vision with its vocation for social responsibility, values and growth axes: talent, innovation and responsibility. After sixty years as a business and thirty as a foundation, Sorigué is evolving towards a project that gives continuity to the organization and allows the continuation of its work of patronage and social responsibility, contributing to the development of the territory, society and to the generation of value. PLANTA is located in La Plana del Corb, Sorigué’s Industrial Complex in Balaguer (Lleida), an environment that symbolizes its beginnings as a company and manifests its values. There, extraction lives side by side with traditional industrial processes, agricultural plantations, research and education centers as well as unique artistic and architectural spaces. Shevirat Ha Kelim (2009). 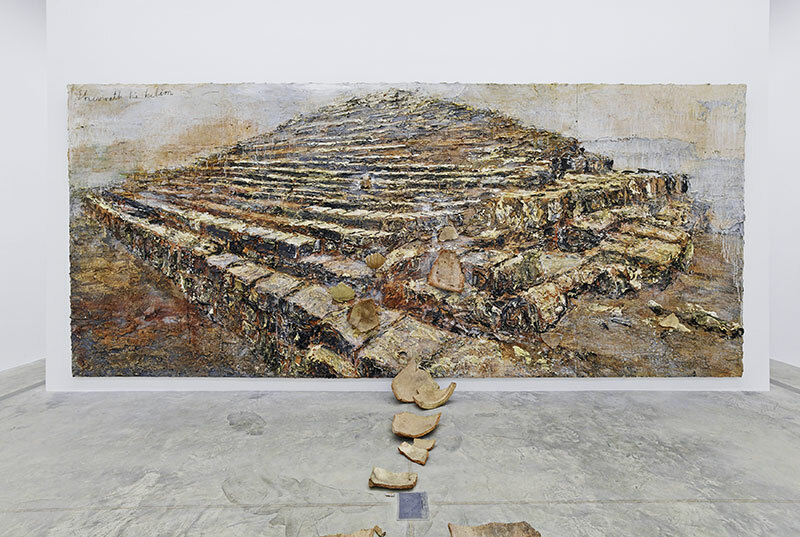 Anselm Kiefer. Artwork located on the first specific site of the PLANTA project, the Kiefer Pavilion.